RPSC (Rajasthan Public Service Commission) Ajmer has declared the final result of RAS 2007. One can access the result at the following link. Can you tell me the ranking of 640 marks in total...what about your result?. RPSC has not declared the merit list yet and with 640 if you are from SC/ST Women candidate you can get allieds. i am a sc male candidate i got 805 marks can i get ras or rps? merit list maybe coming tomorrow itself. 805 with SC Male : not sure but definitely you will get state services. when will rankwise preference for services be declared by rpsc. i got 807 in sc category, do stand any chance for comm tax service??? i got 831 in gen (female)category ,is there any chance? i have scored 805 in we obc?what are my chances of getting proper main ras posts?or i will have to be satisfied with suo ordinate services?please guide. i got 805 in sc, will i get state service and if yes which can it be? if a sc woman gets higher rank in sc merit list then will she be counted in sc general category or she will be taken in sc women category only? hi naresh! i am desperate to have the answer of my question. @ SB : I don't think you would get state services with this score. with 805 in SC depends on how many SC are above you and whether they are opting for services or not. In fact except few no one is sure abt their services so better wait for DoP to come out with the allocation of services. hi naresh my brother score 757 in genral categ. I don't think so because it seems with this score his rank will be beyond 700 that makes really difficult for him. hi naresh, i score 831 in gen fem of other state is there any chance? hi naresh, plz tell me what is horizontal reservation for women in rpsc? Horizontal reservation cuts across vertical reservation and the person selected against these reservations has to be placed in the appropriate category, such as, general / SC/ST/OBC. Reservation for backward classes of citizens (SCs, STs and OBCs) is called vertical reservation and the reservation for categories such as women, persons with disabilities and ex-servicemen is called horizontal reservation. Horizontal reservation cuts across vertical reservation (in what is called interlocking reservation) and persons selected against the quota for persons with disabilities have to be placed in the appropriate category viz. SC/ST/OBC/General candidates depending upon the category to which they belong in the roster meant for reservation of SCs/STs/OBCs. To illustrate, if in a given year there are two vacancies reserved for the persons with disabilities and out of two persons with disabilities appointed, one belongs to a Scheduled Caste and the other to general category then the disabled SC candidate shall be adjusted against the SC point in the reservation roster and the general candidate against unreserved point in the relevant reservation roster. In case none of the vacancies falls on point reserved for the SCs, the disabled candidate belonging to SC shall be adjusted in future against the next available vacancy reserved for SCs. hi naresh i score 831 in gen women categ of other state plz tell me is there any chance to be selected? hi naresh i score 831 i am gen female of other state is there any chance for me ? Hello Naresh, can u plz tell hether the new roster rules issued on 18/09/09 will be applicable to the RAS 2007 result? belongs to SC male , what can i get can u plz tell me. it depends on your rank in SC Male. i have not opted for allied servises other than only Tehsildar in allieds, can i get RTS? because total differance from my rank to total candidates(proper+allied upto meeting Tehsildar)is 26, is it possible to clear upto 84th rank. because last candidate who will be RTS comes at 58 rank if all joins. you will not be called for those posts for which you have not opted in interview and it looks difficult to get RTS, rest depends on other factors too. hi naresh , can u plz tell me if a person had not given any preference to a particular service like allied as above , that person will get a post or not if he is having a low rank? 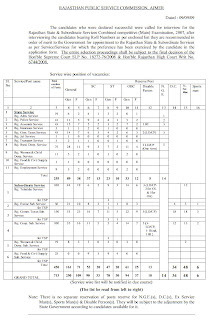 @ above : It's clearly mention in the form while filling the choices that if you not opt for any particular services or post then you would not be considered for those so in case a person is getting particular service and s/he had not opted that earlier will not be allotted that post/service. @ above : I don't think so. THERE ARE RUMOURS THAT GEN CATEGORY MALE CANDIDATES ARE BEING BENEFITTED,IS THIS TRUE? @ Brijesh : That was the case in Supreme Court regarding UPSC and the decision is said to be in favour of the general candidates there which may have some repercussion on the allotment of seats in RPSC too but not aware of whether RPSC will follow that decision or go ahead like previous years. R.A.S. 2007 final me OBC me total 761 marks aaye ha, kya koi chance ha? wht abt d 1st round of the medical..?? whn z 2nd gonna take place..? i got 749 total marks in ras 2007 exams and i belongs to sc female category is there any chance to get any post in allied services? hi naresh please reply me about next vacency of RAS and tentative vacancy of RAS and date of advertisement.